This article is about Palutena's appearance in Super Smash Bros. Ultimate. For the character in other contexts, see Palutena. Palutena (パルテナ, Palutena) is a playable character in Super Smash Bros. Ultimate, officially confirmed on June 12th, 2018. Palutena is classified as fighter #54. Brandy Kopp and Aya Hisakawa reprise their role as the voice of Palutena in the English and Japanese speaking versions of the game respectively, through reused voice clips from Super Smash Bros. 4, although they recorded new voice lines for Palutena's Guidance for new fighters in SSBU, and fighters absent from SSB4, as well as those who were previously DLC in that game. Play VS. matches, with Palutena being the last character to be unlocked. Clear Classic Mode with Kirby, being the eighth character in his unlock tree after Lucas. Have Palutena join the player's party in World of Light. With the exception of the third method, Palutena must then be defeated on Palutena's Temple. Palutena has been greatly buffed from SSB4 to Ultimate. In addition to receiving universal mobility buffs to compensate for losing access to Lightweight, most of Palutena's grounded moves have reduced lag in general. Her tilts and smash attacks come out faster, end quicker, have more reliable hitbox placements, and have more kill power. Her zoning game has improved with Autoreticle coming out faster, and her new side special Explosive Flame allowing her to ledge trap opponents, read landing options, snipe opponents at a safe distance, and KO at reasonable percents. Warp has one more frame of invulnerability and is unique in that it provides Palutena with a landing mix-up option (because of the change to the air dodge mechanic). Finally, her down special is less laggy and now functions both as a counterattack and a reflector. All of these buffs provides Palutena with multiple landing options, a safer neutral, and better zoning tools. She now has a defined strength of long ranged attacks that have excellent utility. Nevertheless, Palutena did receive some slight nerfs. Like all other characters, all variations of her grab have more startup and endlag, which noticeably affects her due to her grab and throw games being her main tool for starting combos. Reflect Barrier can no longer be activated by command, and it has less active frames, making it easier for projectile users to bait her into using her riskier new down special. Finally, her back aerial's invincibility starts comes later, making it less safe to use in the neutral game. As a result of her buffs, Palutena has consistently been a very high-placing character at both the local and regional level thanks to players such as Nairo, Dabuz, Iceninja and Zinoto, amassing arguably some of the most tournament representation of any fighter in Smash Ultimate. Palutena's model has a more subdued color scheme. Her chiton and armor feature simple detailing, and her face appears more realistic and expressive. Palutena's sidestep now causes a visible warping effect when she disappears. Palutena's skirt now has independent physics. Like all characters, Palutena's jumpsquat animation now takes three frames to complete (down from 5). Palutena walks slightly faster (1.21 → 1.271). Palutena dashes much faster (1.888 → 2.077). Palutena's air speed is slightly faster (0.91 → 1). Palutena's max additional air acceleration is higher (0.1 → 0.105). Palutena's falling speed and fast falling speed are higher (1.4 → 1.55) and (2.24 → 2.48) respectively. Palutena's gravity is higher (0.105 → 0.12). When combined with her higher fall speed, this improves her vertical endurance but makes her more susceptible to combos. The first hit of neutral attack has slightly less ending lag (frame 26 → 25). It can now also lock opponents and the multi hits connect more reliably. The first hit of neutral attack has a shorter duration (frames 8-10 → 8-9). Additionally, it no longer launches opponents vertically which when combined with the removal of jab canceling hinders its overall utility. Forward tilt and up tilt have fewer startup frames (frame 17 → 14 (forward), frame 10 → 8 (up) and less ending lag (FAF 68 (both) → FAF 60 (forward), frame 56 (up)). Forward tilt and up tilt have flashier motion effects. Forward tilt's second hit deals slightly more damage and significantly more knockback, now being a situational KO option (now reliably KO'ing at around 150% near the ledge), much like her up tilt, down tilt, and dash attack. Up tilt deals slightly less damage (9.7% → 9%), despite its multi-hits dealing more damage (1.2% → 1.3%). Up tilt has reduced hitlag, allowing the move to execute faster. It also hits 6 times instead of 7. Down tilt has a longer duration (frames 14-24 → 14-27). Down tilt sends opponents at a lower angle, improving its KO'ing and edgeguarding potential (especially when combined with its longer hitbox duration). Dash attack has less ending lag (FAF 52 → 38). Dash attack deals more damage (9%/5% → 11%/7%) with its knockback compensated (70 (base)/90 (growth) → ?/?). Dash attack travels a shorter distance and gains invincibility later (frame 4 → 5). Dash attack now causes Palutena's shield to glow, indicating its hitbox. Forward smash has less ending lag (FAF 67 → 64) and a the clean hit has a longer duration (frame 18-19 → 18-20). It also deals higher knockback (sweetspot: 40 (base)/97 (growth) → ?/? ; sourspot: 40 (base)/96 (growth) → ?/? ), now KO'ing at around 90% (sweetspot) and 110% (sourspot) from center stage. Up smash has less ending lag (FAF 68 → 64). Up smash has a longer duration (frames 18-26 → 18-35), now lasting twice as long as before. This allows it to punish rolls, sidesteps, and air dodge landings much more efficiently. Clean down smash has less startup with more active frames (18-19 → 17-19). It also has less ending lag (FAF 72 → 69). All aerials have less landing lag (20 frames → 12 (neutral), 12 frames → 7 (forward), 16 frames → 10 (back), 24 frames → 14 (up), 18 frames → 11 (down). Forward aerial (9% → 10%) and down aerial (9% → 11%) both deal more damage without much compensation on their knockback, making them stronger overall. Neutral aerial has reduced hitlag, allowing it to execute faster. Back aerial's invincibility starts later (frame 3 → 7). Back aerial deals more knockback (30 (base)/92 (growth) → ?/?). Back aerial now causes Palutena's shield to glow, indicating its hitbox. The last hit of up aerial has less startup lag (frame 25 → 24). It also auto-cancels earlier (frame 64 → 42) now doing so in a full hop. Up aerial now hits 6 times instead of 5. It also has reduced hitlag. Up aerial has more startup lag and a shorter duration (frames 8-23 → 10-22). Down aerial has a longer duration (frame 10 → 10-11). Down aerial is slightly more risky to use off-stage due to Palutena's falling speed being increased. Dash and pivot grabs are slower (frame 9 → 10 (dash), frame 10 → 11 (pivot). All grabs have more ending lag (frame 32 → 40 (standing), frame 40 → 48 (dash), frame 40 → 43 (pivot). Back throw deals higher knockback (65 (base)/70 (growth) → ?/?). Down throw is a better combo starter due to Palutena's lower jumpsquat. Autoreticle's reticle is now red instead of green. Autoreticle's animation is overall faster, with the projectiles being fired sooner (frame 29/35/41 → 25/31/37). Autoreticle deals more damage per hit. Explosive Flame, previously one of her alternate neutral specials, is now her side special. Since Reflect Barrier has been merged into her down special, she has effectively gained an additional move. This provides Palutena with another long-ranged attack option. Explosive Flame deals more damage. Explosive Flame's distance can be controlled depending on smash input. Explosive Flame is now reflectable and absorbable. Warp has one extra frame of invincibility (frames 16-31 → 16-32). It can also grab ledges more easily. Palutena now closes her eyes instead of showing a angry look upon activation of the move. Additionally, she no longer shouts "Counter" until she successfully counters a melee attack. Down special now functions as both Counter and Reflect Barrier. If she's hit by a melee attack, Counter activates; if she's hit by a projectile, Reflect Barrier activates. This allows her to respond to a larger variety of attacks using only one move while also freeing up her side special for an additional move. Both Reflect Barrier and Counter have fewer startup frames and a longer duration (frames 10-31 → 7-34). They also have less end lag (frame 75 → 71). Counter deals less base knockback, but has much higher scaling being able to KO at any given percentage depending on strength. The sourspot of Counter has been removed. Its reduced base knockback however, can no longer OHKO any character at the center of the stage, even when countering with max damage. Reflect Barrier has fewer active frames. Reflect Barrier has a higher projectile multiplier. Palutena can no longer directly access Reflect Barrier. As a result, she can no longer use its windbox on command to gimp opponents, or use the move early to deter projectile use. Palutena's Final Smash, Black Hole Laser, produces a larger black hole and a wider laser, making the attack harder to avoid. Reduced hitlag on neutral air, allowing it to execute faster. Palutena can grab ledges more easily during Warp. Autoreticle deals less shield damage. Explosive Flame deals less shield damage. The super Warp Glitch has been removed. 3% Thrusts her staff forward, emitting a blast of light from its orb. While holding her staff out, she then proceeds to attack with repeated light bursts, followed by a final burst from an upward swipe. The first hit can lock. The final hit does decent knockback allowing it to function as a situational KO move. 6% (hit 1), 7% (hit 2) Telekinetically twirls her staff in front of herself, inwards. This move can hits twice altogether if the tail of the staff hits the opponent. Its long duration and range allows it to punish sidesteps and backward rolls. The second hit has slightly more range than that of the first. 1.3% (hits 1 - 5), 2.5% (hit 6) Kneels down and telekinetically twirls her staff overhead. Unlike her forward and down tilts, it has KO potential due to the high knockback scaling on the last hit. 8.5% (clean), 5% (late) Kneels down and telekinetically twirls her staff along the ground in front of herself. A good edgeguarding and spacing tool, and can even punish sidesteps. 11% Rams into the opponent with her shield. Its clean hitbox grants partial invincibility to Palutena's body and arm (frames 5 and 6 on her upper body; 7-16 on her arm). Her shield emits a shine, which indicates the duration of its hitbox. Goddess Wings 13% (tip), 16% (middle) Conjures a pair of ethereal wings and flaps them forward. This move has a windbox near the tips of the wings that can push away opponents and potentially gimp recoveries. Has quite a bit of ending lag, making this move very punishable. Occasionally, Palutena utters "Goddess Wings!" when using this move. 16% (base), 12% (middle), 9% (tip, early), 7% (tip, late) Raises her staff skyward, conjuring a cyan beam of light that erupts from the ground in front of herself. Has the second highest vertical range of any up smash in the game, surpassed only by Snake's. The beam has three hitboxes: one at the base, one at the middle, and one at the top. Goddess Wings 13% (tip), 15% (middle) Conjures a pair of ethereal wings and flaps them downward on both sides. Its clean hitbox has the highest knockback scaling out of her smash attacks. Much like her forward smash, a windbox appears near the tips of her wings. Occasionally, Palutena utters "Goddess Wings!" when using this move. 1.3% (hits 1 - 6), 5% (hit 7) Telekinetically spins her staff around herself. 12% Rotates her body to slam her shield behind her. Much like her dash attack, the clean hitbox grants invincibility arround her upper body, and the duration of its hitbox is indicated by a shine. Its invincibility is brief, which is just before the hitbox first comes out (frame 7). 1% (hits 1 - 5), 5% (hit 6) Twirls while emitting her halo above her. Purging Kick 11% A downward roundhouse kick. Unlike most meteor smashes, it will always meteor smash midair opponents, thanks to its consistent hitbox. Conversely, it will obliquely launch grounded opponents (grounded opponents in front of Palutena are launched behind her, and vice versa), which allows it to be used as a punishment option from out of shield when SHFF'd. — Telekinetically clinches the opponent. Palutena's overall grab range is above-average: her standing grab is the fourth longest ranged non-tether grab in the game, while her pivot grab also has impressive range. However, her dash grab has a moderate amount of ending lag. 1.3% Emits a burst of light from her staff. 9% Slightly curls herself and then telekinetically pushes the opponent forward while throwing out her arms. It is Palutena's second-most damaging throw, but only has utility as an edge-guard set-up. 10% Telekinetically lifts the opponent and then performs an inverted version of the Arabesque (a ballet position) to fling the opponent backward. It is Palutena's most damaging throw, and her only throw that KOs at reasonable percentages. It is also useful for setting up an edge-guard. 8% Telekinetically raises the opponent upward with her left arm, and heaves them upward by thrusting her staff upward. Despite having high base knockback, its average damage output and below-average knockback scaling make it unreliable at KOing without the use of a highly elevated platform. As a result, it is better suited for setting up aerial pressure. 5% Telekinetically lifts the opponent, then slams them onto the ground. It is Palutena's most useful throw, thanks to its high base knockback, very low knockback growth, and diagonal launching angle. Depending on the opponent's DI, it can combo into any of her aerials. 7% Swings her staff behind herself and then in front of herself before getting up. 7% Same as her frontal floor attack. 5% Swings her staff in front of herself and then behind herself before getting up. Autoreticle 3.5% (per shot) Illuminates her staff's orb to aim a reticle over the opponent, and then fires three energy blasts at that location. It will only fire the blasts if nothing blocks her target, and if the opponent is within range and not intangible. The shots can lock, although due to the changes on locking, it has even less use to initiate combos. It can be used as a way for stopping direct approaches and to force an approach. It is also able to hit opponents behind Palutena, such as if she is moving when it fires and if the opponent is at the maximum horizontal range toward her. Although situational, it also has very minor recovery potential, thanks to it briefly stalling her descent. However, it has high ending lag, regardless of whether or not it targets anything. Explosive Flame 1.5% (hits 1 - 6), 5.5% (hit 7) Creates a multi-hitting explosion approximately 4 character lengths away from herself. If inputted like a smash attack, the explosion hits approximately 7.5 spaces away. The ability to change its range makes it a decent spacing and zoning tool, as well as an edge-guarding option. This move has good KO potential, thanks to its loop hits reliably trapping the opponent, and its last hit having impressive knockback. Warp 0% Disappears and then reappears in a chosen direction. It quickly covers both a respectable amount of vertical distance and a decent horizontal distance while rendering Palutena invisible (frames 16-32). It can also be edge-canceled, which grants it defensive and re-positioning potentials. However, it renders Palutena helpless after she reappears unless it is edge-canceled. Counter/Reflect Barrier 1.3× countered attack/1.4× reflected projectile Palutena uses her shield to catch an opponent's attack. If a physical attack connects, Palutena will forcefully thrust her staff out, creating a blast of light. If a projectile attack connects, she raises her shield to emit a rectangular barrier that reflects the projectile. Black Hole Laser 40.8% (maximum damage) Illuminates her staff's orb and twirls around repeatedly before firing a Black Hole from her staff's orb, after which she quickly retreats off-stage in order to fire a Mega Laser into the Black Hole. The Black Hole does not deal damage, but pulls the opponent into itself and places them in a tumbling state. Conversely, the Mega Laser hits multiple times before concluding with a final blast that launches the opponent and dissipates the Black Hole. Walks out of a golden door that is decorated with her halo's design and emits a bright, shining light. Side taunt: Laughs while using her staff to perform a twirling, inverted version of the Arabesque. Down taunt: Lets go of her staff and telekinetically holds it next to herself, then brushes her hair aside while emitting her halo and saying "Ready when you are." (いつでもどうぞ？, Feel free whenever.) before grabbing her staff. Taps the ground with the tail of her staff and shield in front of herself, during which she briefly emits her halo. Looks away while crossing her staff and shield in front of herself, during which she briefly emits her halo. Twirls with her staff held out, hovering off the ground. She then raises it in an arc and points it in front of her, saying "No one can hide from the light." (さ、回収しましょうか？, So, shall we recover?). If Pit is present in the match, there is a chance she will instead say "Oh, so sorry about that, Pit." (やられちゃいましたね？, Were you hurt?). Enters from the side of the screen hovering. She then briefly spins her staff in front of herself telekinetically, catches it, and stands with it pointed outwards. During the pose, she says "Too bad for you." (ちょっと大人げなかったかしら？, I wonder if you grew up a bit?). If Dark Pit is present in the match, there is a chance she will instead say "Poor little Pittoo." (いつまでも意地っ張りですね～, Forever a nuisance~). Laughs while using her staff to briefly perform the Backwards Showgirl (a pole dancing move) before assuming a seated stance while floating. In the Japanese version, she says (本気出してもいいんですよ？, It's all right to fight seriously.). A flourished remix of a small excerpt of the title screen theme of Kid Icarus, with an original ending. Dabuz - Has a strong Palutena secondary. 2nd at Let's Make Moves, 4th at GENESIS 6. Frozen - Placed 3rd at Collision 2019 and 17th at Let's Make Moves. Gen - 5th at Overclocked Ultimate, 7th at Let's Make Moves, and 17th at Glitch 6 . Light - 3rd at Valhalla II, 7th at Calyptus Cup Inkstrike, and 33rd at Frostbite 2019. Nairo - The best Palutena player in the world. 4th at Let's Make Moves, 2nd at Glitch 6, and 17th at GENESIS 6. Prince Ramen - The best Palutena main in Florida. Placed 9th at Overlords of Orlando: Ultimate Edition and 17th at Smash Conference United. TLTC - The best solo Palutena player in SoCal. Placed 9th at SoCal Chronicles,17th at Ultimate Nimbus, and 49th at GENESIS 6. Trevonte - Placed 4th at Super Splat Bros, and 65th at GENESIS 6. UtopianRay - 17th at Glitch 6. Referring to being a goddess herself, Palutena's opponents all come from series where religion and mythology play a key role, such as the Belmonts being devoted Christians with holy equipment or the Zelda series having multiple deities who often require or grant assistance to the players. The title is the same as a phrase she says in her debut character trailer for Super Smash Bros. 4. Her song in the credits is "Destroyed Skyworld". Note: Most stages play a track from the Kid Icarus universe, no matter what universe the stage originated from, with the only exception being Umbra Clock Tower. Palutena was among the fighters that were summoned to fight the army of Master Hands. During the opening cutscene, Palutena was present when Galeem unleashed his beams of light. She attempted to block a beam with Reflect Barrier, which the beam completely pierced, disintegrating her. Her defeat causes Pit and Dark Pit to lose their Power of Flight, making the duo fall victim to the beams as well. They were all placed under Galeem's imprisonment alongside the rest of the fighters, excluding Kirby. A puppet fighter cloned from her is later seen alongside ones cloned from Greninja, King Dedede, Pokémon Trainer and other fighters. Presumably, Palutena fell temporarily under Dharkon's control after Galeem was first defeated, the narration of Dharkon's introduction being vague on how many fighters he stole from Galeem. Palutena is the last fighter to be found to be imprisoned by Galeem. In The Final Battle, she is called by Galeem as part of reinforcements after Dark Samus is awakened and Crazy Hand is beaten. She is an obligatory unlock for the true ending, as awaking her leads to a battle with Master Hand that frees him from Galeem's control (both of whom's defeats greatly shifts the balance of power in Dharkon's favor). Palutena's Fighter Spirit can be obtained by completing Classic Mode. It is also available periodically for purchase in the shop for 500 coins. Unlocking Palutena in World of Light allows the player to preview the spirit below in the Spirit List under the name "???". As a Fighter Spirit, it cannot be used in Spirit Battles and is purely aesthetic. Each Fighter Spirit has an alternate version that replaces them with their artwork in Ultimate. Palutena summoning Explosive Flame on Skyloft. Palutena reflecting Samus's Charge Shot on Temple. Palutena using her down tilt near an aerial Villager on Gaur Plain. Palutena in her cyan alternate costume on Prism Tower. Palutena catching Mario in the Black Hole item on Gaur Plain. Getting launched by Lunala's Moongeist Beam along with Fox and Samus on Summit. With Pit and Dark Pit on Skyworld. Palutena, Samus, Villager, and Shovel Knight fighting on Find Mii Ω with the Moon about to crash into the stage. Palutena is the only character to have two previously separate moves merge into one, being Counter and Reflect Barrier. 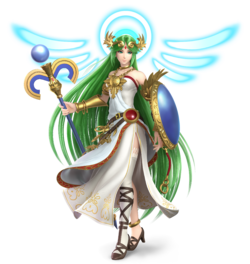 Palutena's artwork was one of three to have been updated on the official site, alongside Falco and Shulk. Compared to her original artwork, her halo was added, her chiton now covers up more of her thigh, and her lips shrank, and her eyes grew. Due to age rating issues, the slit in her chiton was changed to cover up more of her thigh beginning in the 1.0.6. update for Japanese releases of SSB4. This change was retained in Ultimate, including all international versions. While her official artwork depicts the top of the chiton's slit as fused together, it appears to be stitched together on her in-game model. As Palutena's Spirit artwork uses an illustration from Kid Icarus: Uprising, it depicts her chiton still revealing most of her thigh. This is probably an oversight, as the Spirits for Camilla from Fire Emblem: Fates and Mythra from Xenoblade Chronicles 2 had modified artwork to be less provocative. Palutena is one of the last characters to unlock no matter which method is chosen. She's the last unlockable character in Kirby's Classic Mode column, she is the final opponent in the timed encounters, and in World of Light, she is in the Final Battle map. An interview with Masahiro Sakurai revealed that Palutena and Bayonetta were under consideration to survive Galeem's attack in the World of Light opening. They were turned down in favor of Kirby, due to both women being very complex characters to use for beginners and that other characters of their series were also turned into spirits, stating that Palutena couldn't do anything to escape as all other Kid Icarus deities like Hades were also turned into spirits. Both Palutena and Bayonetta are in the Final Battle map, appearing as the last of all fighters. This implies that Galeem (and eventually Dharkon) knew how big of a threat Palutena and Bayonetta were (Palutena being a Goddess, and Bayonetta's slaughter of two gods) to his plans, so he kept them as a last resort. This page was last edited on April 18, 2019, at 19:55.